When I saw this image over on Apartment Therapy I couldn't get over how clever the idea was. And not in a why didn't I think of that way, but in a I NEVER would have thought of that way. Over at A Thousand Words she uses a tension rod under her sink to store her spray bottles. I love it, but I am going to have to wait another year or two until my littles little is just a bit older. She has never been the mischievous kind, but you can never be too careful. But if you don't have little ones or you use only cleaners that are child safe, head over to Jen's blog and get the scoop on this clever storage idea. 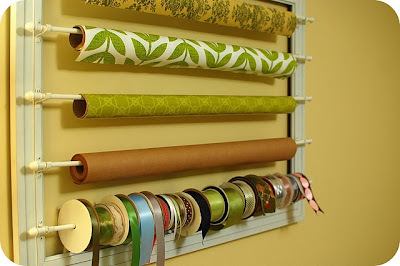 But after thinking about this post for a while, I realized there are a couple other tension rod ideas I have seen recently and I am think they are so clever. So moral of the story, I highly under estimate the cleverness of tension rods. Here are some examples of clever uses for tension rods. I stole this image from my sister in laws blog because I realized I don't have a picture of our the super cute puppet theater that my mother in law made for the girls last Christmas, but it is identical to this one. So if you see any other great uses for tension rods, please send them my way. I think I am going to go buy out all of them I can find! LOVE the spray bottle idea!! Wow something I totally wouldn't have thought of. Thanks for sharing this!!! What a great post! What great ideas!!! Love these! Great ideas! LOVE that puppet theater. Wow- I love the spray bottle idea, and that storage area in general (bottom pic) is gorgeous! I am so going to do that to under my kitchen sink tonight! Using them for spray bottles is brilliant!!!! 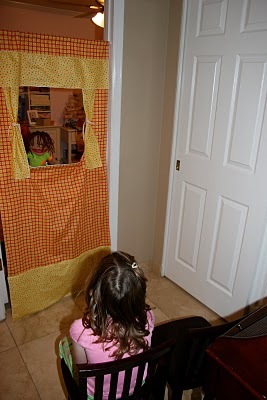 That puppet theatre idea is brilliant--wish I'd thought of that back when my boys were small! And the storage for spray bottles is really smart. There's never a good way to store those; this is a great way to use "vertical" storage space. Total genius! I have my ribbon on a curtain rod but within the shelf/cabinet is my new fave spot!! Thank you for sharing!! I have necklaces and bracelets hanging on a tension rod! it so functional and makes a very cute decoration. I hung 2 hooks on the wall, one for each side! its awesome! Ashley, I can't believe I forgot that one! I have it pinned on Pinterest! Thanks for the link! Aleesa, If you have a picture on your blog I would LOVE to feature it!! 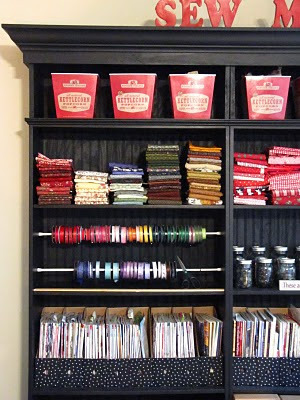 I've been using that ribbon storage in the bookcase for many years now. It was a great idea, especially since some of the items kept on the shelf were not filling up the space anyway.